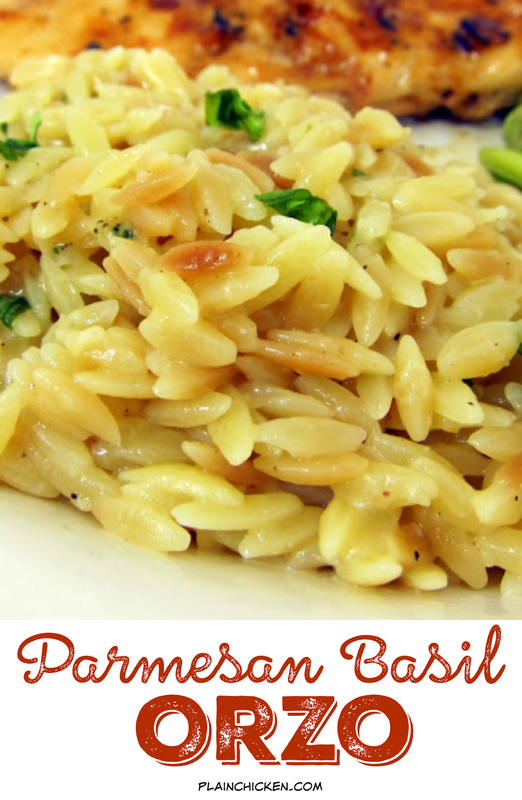 Parmesan Basil Orzo - toss the box and make this delicious side dish! orzo, chicken broth and parmesan cheese - ready in 20 minutes. I am working on cleaning out my pantry. It is a big mess and I am slowing working my way through all the excess food. I found a box of orzo, so I decided to make a quick side dish for some grilled chicken. This is made they same way you make Rice-A-Roni (one of my favorite quick side dishes). Just sauté the orzo for a few minutes, add the broth and simmer. I stirred in some parmesan and fresh basil from our patio garden and viola! Chicken Legs couldn't get enough of this - it was super delicious! It was creamy and cheesy, almost like a risotto. This will be going into the dinner rotation. In a large skillet, combine butter and orzo. Sauté over medium heat until orzo is golden brown, stirring frequently. Slowly stir in the broth and bring to a boil. Cover and reduce heat to low. Simmer 20 minutes or until orzo is tender and almost all the broth has been absorbed. Remove from the heat, stir in the basil and Parmesan and salt and pepper to taste. We love orzo at our house. Thanks for giving me a new way to serve it. Thanks Steph, I have been looking for a recipe like this, looks delish! This looks yummy. You and chicken legs must like Lima beans because they seem to be in most of your pictures. I'd be with Chicken legs and want a bunch of it. I'm doing the same thing. Don't need to buy anything else till I use up a lot of what we have. I'm always hunting for new side dishes and this one look delicious. Thanks for sharing!! Thank you for posting the Parmesan Basil Orzo recipe. I made this Thursday night. The directions do not state when to add the garlic powder, so I stirred it into the orzo as it simmered. This is a fabulous side dish, and I plan on making it often. Steph, I love, love, love your recipes! Thanks for sharing this one. Now I can use my pkg. of multi-colored orzo that has been in my pantry forever ;o) Can't wait to try this! BTW...did you use the "green can" parm? The green can Parmesan will work great in this recipe. Enjoy!! This recipes is wonderful. It is easy to add things to also. I often throw extra veggies and chicken from the fridge to it so those things don't go to waste. I just add them at the end with the parm and basil, as long as they are already cooked. Some of our favorites, shredded chicken or pork, mushrooms, onions, cauliflower. When does the garlic powder go in! ?